The digital text project provides a process to support students with print disabilities (learning disability, visual impairment, physical disability) in the general education curriculum. Access is available to resources (Infinitext, Bookshare, and Learning Ally) for students who qualify under copyright waiver as print disabled. These sources provide paired audio and text, which is a best-practices model for increasing reading skills of comprehension, decoding, and fluency while promoting independence. 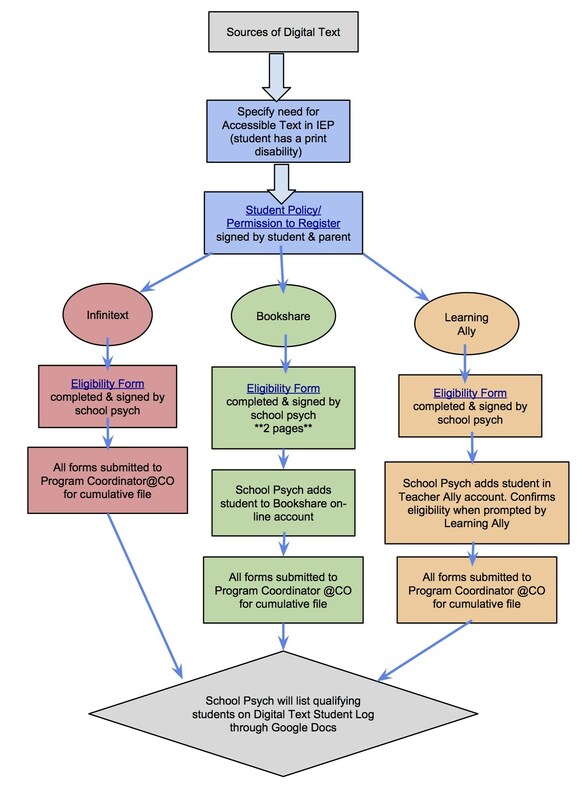 The process for registration is outlined in the accompanying flowchart with related forms. Teacher responsibility is to obtain signatures on the Student Policy/Permission to Register form. School Psychologists are responsible to complete paperwork for each agency.